The GearWrench Wheel Weight Tool installs, removes, trims and tightens all types of clip-on wheel weights, The gearWrench Wheel Weight Tool features a special plastic type material on the hammer head for safe, mar-free installation of specially coated wheel weights used on alloy wheels, and has a plastisol-dipped handle for comfort. Replacement Part: 335804 Plastic Tip and for intended use only. The 335804 GearWrench Wheel Weight Tool Replacement Plastic Tip is one of thousands of quality tooling products available from MRO Tools. Please browse GearWrench Wheel Tools for tools similar to the 335804 GearWrench Wheel Weight Tool Replacement Plastic Tip. 335804 GearWrench Wheel Weight Tool Replacement Plastic Tip description summary: GearWrench wheel weight tool replacement plastic tip. 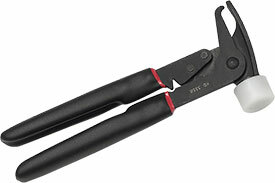 Quantity discounts may be available for the 335804 GearWrench Wheel Weight Tool Replacement Plastic Tip. Please contact MRO Tools for details.